﻿ Genesis 12:3 And I will bless those who bless you, And the one who curses you I will curse And in you all the families of the earth will be blessed." And I will bless those who bless thee, and he who curses thee I will curse. 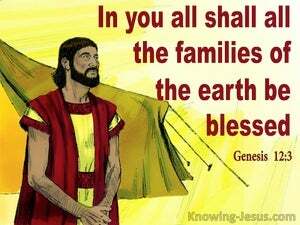 And in thee shall all the families of the earth be blessed. And I will bless those that bless thee and curse those that curse thee, and in thee shall all families of the earth be blessed. And I will praise them praising thee, and I will curse him cursing thee, and in thee shall all the families of the earth be praised. 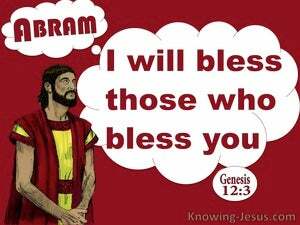 And I will bless those who bless you, and those who curse you I will curse. And all families of the earth will be blessed in you." 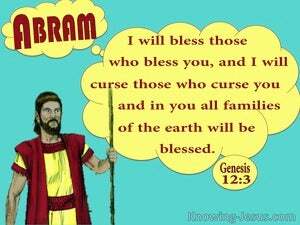 And I will bless those that bless you and curse the one who curses you. And in you shall all families of the earth be blessed. And I will bless them that bless thee, and curse them that curse thee. And in thee shall be blessed all the generations of the earth." And I will bless those who bless you, and I will curse him who curses you, and in you all of the families of the earth be blessed." 2 And I will make you a great nation, And I will bless you, And make your name great; And so you shall be a blessing; 3 And I will bless those who bless you, And the one who curses you I will curse And in you all the families of the earth will be blessed." 4 So Abram went forth as the LORD had spoken to him; and Lot went with him. Now Abram was seventy-five years old when he departed from Haran. May peoples serve you, And nations bow down to you; Be master of your brothers, And may your mother's sons bow down to you Cursed be those who curse you, And blessed be those who bless you." "He crouches, he lies down as a lion, And as a lion, who dares rouse him? Blessed is everyone who blesses you, And cursed is everyone who curses you."